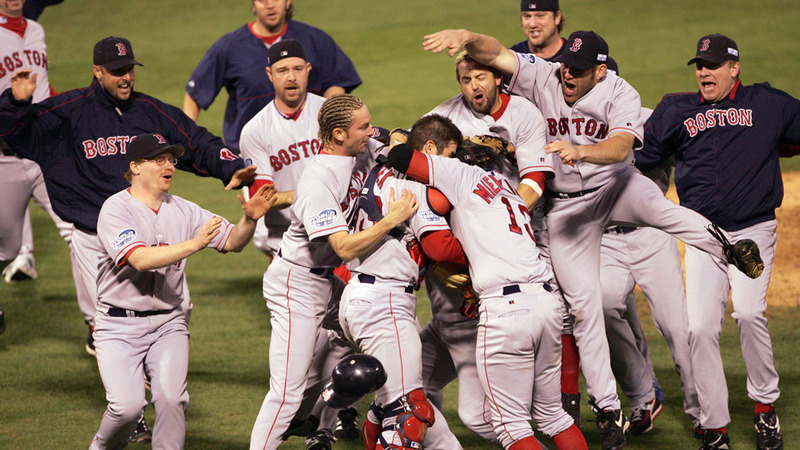 The Boston Red Sox entered the 2004 World Series with unprecedented momentum that was way too strong for the St. Louis Cardinals. After making baseball history by coming back from a 3-0 deficit to defeat the New York Yankees in the American League Championship Series, the Red Sox had become a force that even overpowered an 86-year-old curse. Legend had it that, after winning the 1918 World Series then selling Babe Ruth to the Yankees, the Sox were cursed to never win it again. Bill Buckner's infamous error in the 1986 World Series was all the proof some people needed of the curse's validity. But first-year manager Terry Francona and an enthusiastic bunch of players, lovingly branded by outfielder-first baseman Kevin Millar and outfielder Johnny Damon as "the idiots," would not be crushed by the weight of history. Nor would they be slowed down by the Cardinals, whose Tony La Russa became the first to manage in both leagues in the Fall Classic since Sparky Anderson (Reds and Tigers). A Cards team that featured Albert Pujols (46 HRs, 123 RBIs) and Jim Edmonds (42 HRs, 111 RBIs) and led the NL in runs, and boasted a pitching staff that gave up the league's fewest runs, was still no match for the Red Sox's October Magic. It was a four-game sweep. Game 1 at Fenway Park was a wild one in which the Red Sox outhit the Cardinals, 13-11, but also committed four errors to the Cardinals' one. The Sox's David Ortiz homered in his first World Series at-bat for three runs in a four-run first. The Sox led 7-2 after three innings and 9-7 going into the eighth before outfielder Manny Ramirez made consecutive errors to allow the Cards to tie the game. But after the Cards' lone error in the bottom of the eighth, Mark Bellhorn homered off Pesky's Pole in right for the winning runs in an 11-9 decision. Bellhorn led the AL with 177 strikeouts during the regular season, but none of those were remembered on this night. His bloody sock from his classic ALCS performance already a part of Beantown lore, Curt Schilling took the mound for Game 2 with stitches in his right ankle as part of the repair for a torn tendon. Schilling gutted out 94 pitches over six innings, struck out four and held the Cards to four hits and one run. Once again, the Sox committed four errors, with a World Series single-game record three charged to third baseman Billy Mueller. Also, Pujols led the Cardinals by going 3-for-4 with a double. But the pitching of Schilling and two RBIs apiece from Bellhorn, Orlando Cabrera and Jason Varitek were enough to overcome all that in a 6-2 victory. Game 3 at Busch Stadium is remembered for starting pitcher Pedro Martinez's seven scoreless, three-hit innings in a 4-1 Sox victory. In St. Louis, however, pitcher Jeff Suppan's baserunning mistake is the unforgiving memory. Suppan was at third and Edgar Renteria at second with no outs in the third when Larry Walker grounded toward first base. Suppan inexplicably stopped on his way to the plate and returned to third, which forced Renteria to return to second. Ortiz got Walker at first, threw to Mueller at third to retire Suppan, and the rally was finished. The Cardinals went quiet until Walker's homer off Keith Foulke in the ninth, but the Sox were nonetheless a win away from putting the curse to bed. Red Sox right-hander Derek Lowe made sure Game 4 would be a coronation. Lowe struck out four and held the Cards to three hits in seven scoreless innings. Bronson Arroyo, Alan Embree and Foulke would finish off a 3-0 championship victory, allowing one hit in the final two innings. Johnny Damon's first-inning leadoff homer gave the Sox the only run they'd need. The pall that hung over Red Sox Nation was lifted. After 86 years, it was a new day in Beantown. While there were contributors to the sweep up and down Boston's lineup, Ramirez was named the Series' MVP by hitting .412.